Synapse Exhaust - Downpipe - Dezod Motorsports Inc - Home of the automotive performance enthusiast since 2002. Synapse Engineering’s R35 GTR downpipes are race-proven and dyno tested to gain 25 HP to the wheels This configuration is made of 304 Stainless Steel. This configuration has been designed and tested in competition. Although heavier than Titanium, 304SS has 2x the shear strength of Titanium under normal and extreme operating temperatures. 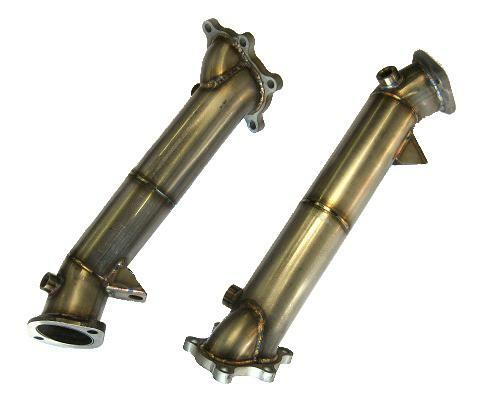 This is the race configuration that elevates the exhaust note and does not include resonators or catalytic converters.This design increases the diameter of the downpipes and reduces backpressure after the turbo. This product is recommended for off-road use only. Synapse GTR exhaust products are made to order, therefore please allow 2 weeks of production time before shipping. Performance increase may vary between vehicles base on modifications, dynanometer, and testing environment.